Announcement: WUWT success earns an invitation to "Enterprise" | Watts Up With That? Announcement: WUWT success earns an invitation to "Enterprise"
As a result, I’ve been invited by the higher ups at WordPress.com to join WordPress Enterprise, at a reduced rate from the normal $500 per month. There’s a backstory that I might be able to tell someday, but suffice it to say that I believe I owe this opportunity to something Al Gore did against WUWT . This Enterprise level of service will add lots of functionality, and the best news: it will allow you to edit your comments to fix typos and other issues, a feature most often asked for. It will open a whole new dimension for WUWT in many many ways with new features and ways to improve global visibility. This, all while maintaining the high level of uptime and hardened network firewall against the attacks from people that want to bring it down. I’ve accepted the offer. 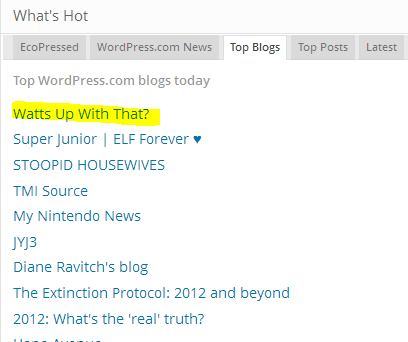 Thanks to everyone: the moderators, the readers, and the guest authors for bringing WUWT to the top. The change will be about a month away. There’s a major amount of importing and conversion that must be done by the wordpress.com staff. On the downside, there’s a cost, not unlike having a monthly car payment. Gone will be the days of a free ride on wordpress.com . I’m hoping that WUWT readers might consider helping me with maintaining the experience. If so, I’ll look into a monthly PayPal program. Congratulations and great news Anthony! Looking forward to the new features. Being able to fix my own frequent typos should would be nice! I’m sure there are a whole bunch of people like me who would happily set up a $1-$5 a month donation from my paypal account. Painless entertainment, and like Mark Bofill, I want to tell people how your website is funded. Please get that PayPal program set up. Some things are worth subscribing to. Please consider an alternative to PP that some, in principle, cannot use. Given the grief I was given for appearing on PBS last year, it would be fulfilling. There’s a backstory that I might be able to tell someday, but suffice it to say that I believe I owe this opportunity to something Al Gore did against WUWT . I have been reading your blog for a long time now and value it as a sour e of common sense information and a counterbalance to the mainstream BS we are subjected to daily. I would be happy to pay a monthly subscription to support you invaluable work. Congratulations, Anthony. Your success is richly deserved. I pledge 1% of all book sales to support your efforts to keep respectable debate alive. What are you going to do with all the extra money (what a funny sounding phrase)? Congratulations! Although I am somewhat mystified by the company up there. While I do not read them, I expected to have at least heard about them. Other than STOOPID, I have not. Just goes to show how little I do know. Fantastic congratulations! A huge affirmation on what a spectacular site this is and how commendable your level of work is. I don’t use paypal unless I need it, which is rarely. So a paypal one-time contribution/subscription would work for me. Since Glen Beck doubled his monthly fee for the Blaze on line TV show (it just sort of expired, cause I wouldn’t pay the $10/mo), I would gladly donate $5/mo to WUWT as it gives me much more entertainment and pure science knowledge than the Blaze TV. Congrats, Anthony Watts. I see that your blog stats have arisen to the level that the AGW alarmists wished the temperatures would also arise to confirming their folly. Hey Mike. Is that a hockey stick I see in that graph? Can we assume that since you will be paying for the service, the only ads we see will be those that you place there? they should be paying you! Philip Peake – There are ads on WUWT? I’ve gotten so use to completely ignoring ads on websites I hadn’t noticed. Anthony – just sent myself an e-mail to remind me to donate. PJ Media has an automatic set-up to deduct from a credit card; I subscribe to support their enterprise, if for no other reason, and I can say $5.00 a month is pretty painless. Hopefully you can do the same through PayPal – let us know when you get it set up and I’ll sign on to that, too. The extraordinary ranking of your venue is the best kind of positive energy feedback loop to increase stimulation of critical independent thinkers in every country. You and everyone of them can draw rejuvenating intellectual energy from it. Wow. I can and will make a single modest contribution yearly to help defray the yearly costs of your WP Enterprise status. Hey, in approximately the last week it looks like there is a significant upward spike in the ranking of Cook’s Skeptical[-less] Science site that appears to coincide with a similar upward movement of WUWT’s ranking. I think your recent posts focusing on weird / problematic aspects of Cook’s Skeptical[-less] Science site has large numbers of people going there to quietly verify the WUWT reports and laugh at Cook’s Skeptical[-less] Science site. to quote someone I can’t stand….this is a big f’in deal! Count me in for monthly subscription! 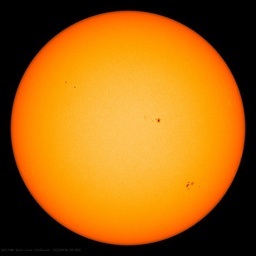 The AGW crowd will see this as another nail in their coffin! Almost as painful as this year’s Arctic ice melt. Well done, Anthony! I assumed Exxon would be funding you as usual 😉 Since they aren’t I’d be happy to help keep WUWT up there where it belongs. Good stuff Anthony,it’s well deserved. You (and your excellent team of moderators) are, and have always been, #1 on our list, Anthony. CONGRATULATIONS!!! @ Jim Steele (10:40AM today) — What a generous offer. Thank you for subsidizing the learning of all of us and the cause of truth! I wonder how many of those visitors came from the other camp, curious about what all the fuss was about? Congratulations! I bet that the rise and rise of WUWT is causing a certain amount of underwear wadding amongst the Warmistas! I’ll most certainly be in is there’s a regular subscription service. I’d be proud to help support this fantastic site. Great news Anthony, but watch out for Nobel Laureate M. Mann, he might sue you for infringing on his “Hockey Stick” copyright. You have made a difference in the Web, not the only one, but a most significant for science. FWIW I’m in for the painless monthly set and forget donation. 1) Am I the only one still reading RC? 2) It looks like SkS has quite a bit of volatility, could they be getting traffic spikes when WUWT highlights some [self-snip] over there. 3) Do the absolute traffic numbers reflect that there’s an increase in traffic to WUWT causing the relative increase or is it a decrease elsewhere? Going to get you a giant ‘We’re #1″ foam finger for you to wear at all speaking engagements! Wait, can’t you use all that oil & gas company money to fund the site??? I like that! Your book just made my Christmas list alongside some other excellent authors. I would be happy to make donations, but NOT with PayPal! Is there any possibility of direct contributions from a credit card? For those railing against PayPal – it is a more secure payment option that inputing your credit card information…. I would prefer to give a cheque for a lump payment. I paid PayPal for a diver’s or golfer’s watch or some such to the benefit of some guy in Arkansas. I’m not sure how it happened. I got a notice that I would be receiving it soon, I alerted my credit card company and they said I had to wait until it was billed then they would deal with it. One thing and another I forgot about it for the longest time. I don’t buy through them anymore. BTW, how will you handle the occasional visitor? You do want to continue to increase. Also, it will be interesting to see how many trolls will pony up for the privilege. Can I donate right now? Since I block ads I feel that my “account” is in arrears. Donate button (surfacestations.org) is the right place I’m guessing. Yeah, well- I’m sure your mother scolded you when you were eight and about to pull some bonehead stunt which would have broken both your legs, too. 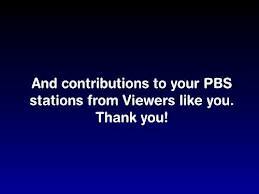 By the way- did PBS play straight and narrow with you? No? Which other camp? Here we can hear comment from both sides, and posts are not all really one sided, but fact and data based. Is the other camp really the fever swamps where every single post follows the warmist dogma, and comment sceptical of posts or other comments are swiftly deleted? If there is a warmist site on “the other side” it would have to be one that allows the free flow of ideas, data, and links, I have yet to find one. Anybody know of one? Almost there, sks are about 100k and WUWT are 4k that makes it a 96 percent consensus against the consensus. Let us know about a recurring PayPal option. I will commit to a year’s worth of regular monthly donations. I can easily afford it as I am flush with secret cash payments from the fossil fuel industry. /sarc, for the humor impaired. (The commitment is genuine, not a joke). I’ll subscribe, but I prefer an annual payment. Keep up the good work, Anthony. Looks to me like Real Climate is not a mass media bog. It is effectively a in-house noticeboard. Nothing wrong with that but it won’t move the public debate. Which was its original intent. SkS only registers occasionally. The biggest peak matches WUWT’s recent expose of creepy photos. It looks like SkS is just a trampoline for WUWT. But in the other hand they do also broadcast, Via Dana N, on the Guardian website. WUWT is on a different level to all other climate blogs. 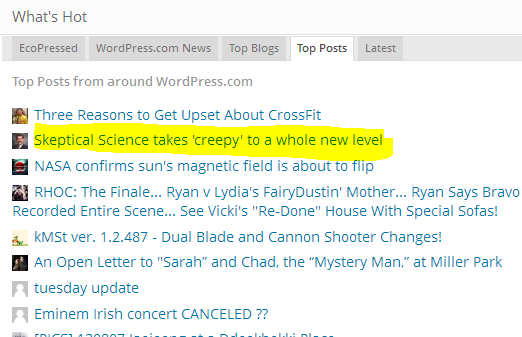 So is it actually a genuine science blog, not just climate? Is WUWT the internet science channel? If so New Scientist and Scientific American will be text-book cases in business schools for missing the boat – Rank Xerox style. Their political alarmism lost them their obvious opportunity. Congratulations, Anthony. With all of the great stuff you provide for battling it out with the ill informed, it’s this kind of stuff that I love to throw in their faces. Congratulations and well-earned prestige for all Anthony’s hard and un-ending work. Thank heavens WUWT got ahead of ‘Stoopid Housewives’ in the rankings! I’m another that would like to set up a monthly payment. I’m afraid it will be rather small but hopefully they will all add up. I’ll sign on for a monthly PayPal contribution, funded from my pension, with enthusiasm and pleasure. Kind of odd though that the top ranked post has nothing to do with climate or science. Regardless, congrats too to Willis for his part in this record breaking streak. I’ll be happy to join Exxon, the Heritage Foundation, and any other deep pocket contributors (joke, of course) with my own trip to the PayPal button. Yes – I can help. When Paypal is set up, help dino-sour like me with a Paypal101 for Idiotic 9idiosyncratic) posters. Pretty please! Gratz to Mr. Watts. Well earned for all the quality hard work. Revkin deserves no praise from a decent person like you. I posted a a non-offensive comment with this link highlighting an environmental pogrom. “Tens of millions of pounds of UK aid money have been spent on a programme that has forcibly sterilised Indian women and men, the Observer has learned. Many have died as a result of botched operations, while others have been left bleeding and in agony. A number of pregnant women selected for sterilisation suffered miscarriages and lost their babies. (A) working paper published by the UK’s Department for International Development in 2010 cited the need to fight climate change as one of the key reasons for pressing ahead with such programmes. Sterilisation has been mired in controversy for years. Revkin’s actions & silence says it all. Especially if I can correct my typos 9see)! Auto – with a red face. Not sure who useful this woould be for me as I never make typpos. Oh – and this needs to be a sticky post! Using FF, and the Adblock Plus add-on, I’ve never seen even one. Here or on any site. I can forego a bottle of red every couple of months and donate the proceeds. This is a site worth paying for. You may be surprised by the number of people and amount people are willing to donate. How would the IRS view this sort of thing? A rhetorical question perhaps. A 501 c (3) might fit the bill and it would really put the wind up a lot of non-skeptics on the other side. I personally will drive my truck less and donate the difference in fuel expenses. Of course this makes it a fossil fuel industry derived donation. Great news and a fine reward for all your hard work and honest reporting Anthony….one of the webs heros! An Annual suggested donation would work for me. If you made it a subscription service then it would end up being Paywalled when you handed over the reins to some one trained to maximize the bottom line. That then would prevent the openness that this discussion board still allows. I have ditched my subscriptions to Scientific American and New Scientist, because I no longer trust them. A subscription to this site, as long as it discusses science, is then appropriate financially. The 20/80 rule still will apply. A-th-y, it will come as no surprise to you (if you’ve read even 10% of my WUWT posts) that I LOVE THIS little tune (below). This video even features WEATHER! — and you and the mods are the stars (on your flying surfboard! — and all of us are in there, too (even jai playing his magic horn — and even the kangaroos of Canberra)!!! This SUMS UP HOW I FEEL ABOUT WUWT!!!!!!! Anthony….I am only a poor retired ex-military Canuck,but I would defintly donate.The only other place I can think of more deserving of my few bucks is the local food bank. This site is a beautiful sunrise on a dark morning.And Mr Steele(from another Steele),I have never read any of your stuff,but will start researching. And where can I get protection from all the exploding heads that will be coming from the eco-cultisits? The question is to which of the world’s two largest demographics WUWT appeals ? I am one of the retired fossils willing to fuel the improved endeavor. While this is a nice idea, personally I think that the greater the distance from the IRS, the better. There are too may caveats and legal issues involved with a move like that. IAMNAL (I Am Not A Lawyer), but a small business owner. I am sure Anthony understands this. Given the intrigues with the IRS, the best thing is to keep a low profile, no matter what it costs. You will have my support whether its subscription or voluntary donation. Well done! While congratulations are certainly in order, I think the reason why there’s an upper bound on size for WordPress.com blogs, is that beyond a certain level it makes sense to host it yourself using just the WordPress software (or others) using a dedicated host some place. I think you get to keep much more of the ad revenue that way, and have far more control. I am sure that idea has been considered and discarded over the years. Does that mean anonymity disappears? What if you don’t want your wordpress handle attached to a paypal account, or can’t because paypal restricts multi-email/account usage from its end? Will there be a mechanism to accommodate that? Or, will there be a set amount you, WUWT, must make every month (per WordPress) and donation into a pot can do it? Were they ever looking down? It seems to me that WUWT has been a continual success story. Well done Anthony. Keep going, be the reed that doesn’t bend. They were never down, RoHa is correct! Perhaps you can get Benji to start a club with membership fees. Congrats Anthony! I would also be more interested in an annual donation preferably by credit card. I have “issues” with Paypal. Congratulations, Anthony. For the subscription price, perhaps you could establish a tiered membership like the talk show guys do. Think emails, newsletters, access to papers, etc. I look forward to the opportunity to use the new features. Congrats Anthony and I appreciate the shout out to Andrew Revkin. There’s a lot of snark out there and I’d like to think most of us can remain above it. It’s good to know the communication lines and a mutual respect exist between you two – it’s the only way to debate “consensus” thinking. @Ian Watts Re WordPress self hosting. While it may seem more profitable, this is generally a bad idea, as the WordPress software is prone to many security holes if not setup properly and constantly maintained. Best to pay the price and let the PTB handle the nightmares. Anthony, I have supported you for years in my small way. I will continue to do so. Just let me decide how much your site is worth. Let me change my subscription any time I want, up or down. Then continue to keep me interested with honest reports and full disclosure so we all can make up our own minds. Good luck! I will subscribe. HOWEVER, the most important component to WUWT from my perspective is it’s accessibility and forum for really interesting perspectives. I am concerned that with out a wide and wider audience WUWT will just be concentrating the similar perspective and in effect breathing our own vapors..
Gore, Hansen, Mann and the other greenfleecing scumbags spend their lives on planes going from one green jamboree to the next, racking up, what they themeselves would term, huge demonic carbon footprints. Yet, Anthony Watts conquers the world from an armchair, a wordpress account and a few solar panels on his roof. Oh, the irony. Very pleased for you, AW … I raise my glass to you … health, wealth, and prosperity ! Wait a minute! Are you saying that this is going to be a subscribe only website. If my friend, a computer scientist PHD will have to donate to join the thread, he won’t do it. Bad idea if it;s true. You will only be preaching to the choir if you have to pay to play in the now open thread and your thread posts will be cut in half if this is true. Heartfelt and well deserved congratulations to you Anthony. How far up the mountain this website has come from its very humble beginnings. I remember when Holtquist, Wilde, and Chiefio were almost the only people having conversations that amounted to anything in the comments. Yes, there was also one odd galah who seemed to insist, in his global warming enthusiasm, that a children’s school was located someplace in the Pacific just off the coast near Perth. Why mention any of this? Because when you recall something of how simply this site began, what it has turned into is all the more astonishing. I don’t believe there is any suggestion of a paywall. I believe our host is asking whether some of us are prepared to help cover the extra cost, and happily a great many of us are. This popularity of this central clearinghouse blog is important since uninitiated laypersons so far only suspect that Global Warming was just another mistaken prediction and especially the younger generation is still so enamored with the popular science guys on TV who still promote alarm that they remain quite clueless that a classic case of fraud is at the very center of that theory via Team Hockey Stick, the “smartest guys in the room” who just like Enron executives were among the most qualified to not make mere sloppy mistakes. In time we will be universally looked up to as heroes, not just cranks who once happened to be randomly right about some expert level technicality. WOW! I just visited your art site. Someday, your paintings will be considered by the ENTIRE world (not just the art world) as the equal of any of the French Impressionists. Stunning. I could feast my eyes on “Palapa Blanket” all day. Two other favorites: “Tuckerton” and “Nebraska Memory” — beautiful. May I suggest that you re-name “Acidman” –> “Vibe Man” (as in vibrant and in “vibes”, the “acid” had too much of the dingy, repugnant, connotation of someone on an acid trip (he had such a fine, handsome, alert, countenance…); even if he was an acid head, the PAINTING deserves a better name, imo). Revelling in all those bright, happy, vibrant, colors reminded me of a book of colors (each 2-pages with objects painted in the theme color only) I loved as a child. I can STILL feel the feeling of the orange and the green and the purple (hey — interesting …. coincidence?, the secondary colors remained most vivid in my color-sensation memory) pages. I don’t just see them in memory, I can feel them. I LOVE COLOR! Well, this thread is nearly dead, I think (thus, I wrote so far off topic). I hope you see my admiration. I KNOW you do not need it — you are world class. Vaya con Dios and WELL DONE! Thanks Janice, this one is a keeper for me. Actually Acidman was the first blogger I followed, circa 2005 or before. The site still functions even though Acidman passed away in 2006. He was way ahead of his time on the CAGW thing too, come to think of it. First time I have checked his site in years – so thanks for that Janice. I’m still waiting to be discovered in the art world. I’ve been experimenting with color against color since the late 60s. * Tell me that guns are evil. * Tell me that I’m a racist but Jesse Jackson is not. * Listen to rap music. * Quote Maureen Dowd at me. * Wear a stud or an earrring in your nose. * Wear sandals with black socks. * Refuse to eat collard greens. * Go into a nice steak restaurant and order chicken. * Insist on making love with the lights off. * Get all your news from CNN. * Wax nostalgic for the wonderful days of the Clinton presidency. * Use the term “assault rifle” when you don’t know what you’re talking about. * Refuse to eat grits. * Call Southerners “Red-Necks” while praising the virtues of living in New Jersey. * Brake for animals unless the animal is larger than your vehicle. * Praise the Endangered Species Act. * Say that I’m not a true Southerner because I like Manhatten-style conch chowder when the alternative is New England style. * Tell me that Jimmy Carter is a great man. * Put up with a sassy-mouth from your child. * Tell me that Southern iced tea is too sweet. * Call SUVs tools of the devil. I’m really not that difficult to get along with, but certain things just piss me off. J. Philip Peterson, for what its worth (and as I am not an art expert it’s not a lot) I find your paintings interesting and pleasing. Sort of fauvism meets Monet… with a slightly more subtle colour set. I like it. Thanks for letting us see your work online. Phil.. ever since I’ve known you (over 40 yrs) you have been one of the most uniquely established Impressionist painters to ever set a brush to canvas. I have no doubt that you have merely touched the surface of success and will one day receive the recognition your amazing works deserve. Recently I keep running into people I haven’t seen for 40 years. Thanks for reminding me Jo. I am humbled by your compliments, Janice, M.C., and Jo. @ J. Philip Peterson, thanks for letting us know you “heard” us! LOL, that “Acid Man” must have been a fun guy. Thanks for sharing his list, heh, heh. I could agree with almost all of it (ESPECIALLY the socks (of ANY color) with sandals! ugh). I suspect a lot of WUWT readers would like more science and engineering. climate science is more like a drama class dressing up in lab coats and carrying clip-boards, pretending this makes them scientists. It they want to appear smarter, they put on glasses. fun to watch but after awhile it isn’t as interesting as real science. I agree. This is a science site, but check out “Night & Day” (Just posted) which doesn’t work too well with the now banned Incandescent light bulbs!!! I think this might be color science. Could you use my contact form to maybe discuss this further? Thanks. Just uploaded a lot of new images…Hey this is science…WUWT.!!! @ J. Philip Peterson — Certainly! Glad to (and, just did).